I had thoughts about writing this in the style of Chuck Palahniuk. I abandoned that idea quickly. Regardless, Chuck of the clan Palahniuk is one of the bigger names in modern literature. Two of his books, Fight Club and Choke, have been turned into great movies. Sorry, Choke was alright. Fight Club was the phenomenon. Now, most of you know of Chuck and his works, so there is no point writing about that. But… most of you don’t know of my experience with Chuck, meaning both his body of work and the man himself. Yes, I met Chuck Palahniuk. More on that to come. In high school, a buddy of mine had a strange looking book. It was purplish-white and had a pallid, screaming face. In sketchy white letters, the cover read “HAUNTED” with the authors name in smaller type. I inquired, and he told me to read the first short story in the tome, which was the ominous “Guts.” Go ahead, follow the link. I dare you. The sick imagery and sharp word choice hooked me immediately. I bought the book that weekend. Fast forward a year. I had ever Chuck book that was published at the time. I still do. The only one I don’t own is “Damned,” and that’s just because I’m waiting on a paycheck. So, I bought every one as soon as they were released, and read them as fast as I could. Most of them are good. I’ll reserve my judgements for quiet conversation, not the bullhorn of the Internet. We pack up a little sedan with pillows and books, found a good place to sleep in Maryland, and set out. We debated about what books we would have Chuck sign. I picked my two favorites, along with the newest release “Pygmy”, to have signed. In line at the bookstore, we fretted over what we would say to the man when we met him. I knew nothing I could say to him would stick in his mind, so I didn’t worry too much. Basically, once I saw him, I handed him my books and an assistant my Polaroid camera. 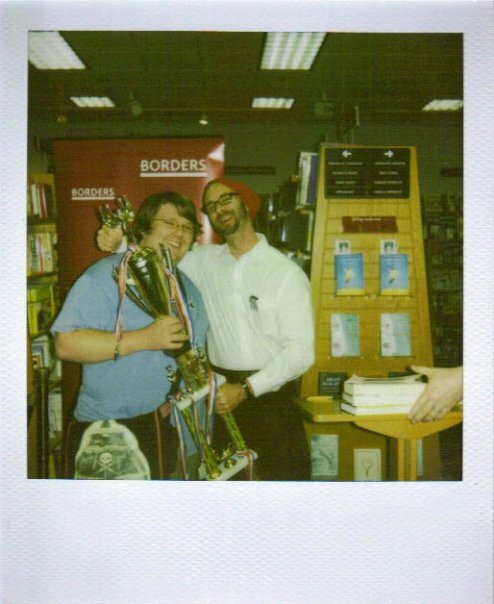 Chuck gave me a giant trophy, threw his arm around me and snapped a picture. We talked a bit while he scribbled in my books. Fast forward through the reading of “Jabberwocky” and strange games involving blow-up penguins (among other things) and we were on our way. The trip home was long enough to allow the events to wash over us. Of course, it was a bit stuffed in that sedan with all those blow-up penguins in the back seat. Thanks to Sam Jones for the challenge that lead to “The TriChuckta”. I felt like I should include that picture for proof. Just ask some of my Morgantown friends. They have pics with him, too. Also, only three of us get blow-up penguins. The blow-up object that my ex-girlfriend got was definitely more… risque. This entry was posted on	November 11, 2011 at 11:11 am	and is filed under Books, Life-Changing Events.